15. (2 soldiers) Two soldiers killed with baggage train. This site may be the valley behind 41 Academy Street (see below). This site is just west of Arlington cemetery and is surrounded by houses. There is a deep ravine located in the center of this group of houses. 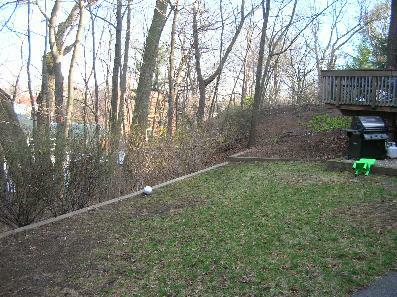 This is the backyard of the house at 41 Academy Street. The wall defines the edge of a deep ravine that is to the left in both of the pictures. The dead horses were dragged over to the field just this side of Spring valley at the side of Spy Pond. The bones were visible for many years. (439 Somerville Avenue, junction with school street). The cemetery is chained shut. The site is in the far corner near the back. 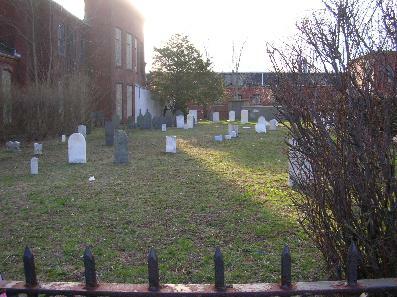 This is the back of the cemetery as taken from the adjacent Market Basket parking lot. The soldier�s grave would be in the far back corner.